Families of the Dublin-Monaghan bombing victims are currently suing for the release of files. 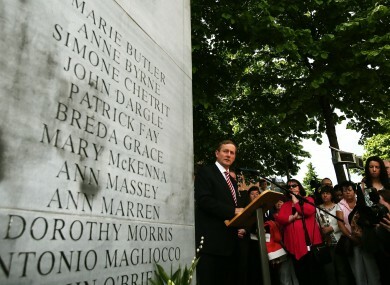 Enda Kenny speaks at the 40th anniversary of the bombings. OPPOSITION PARTIES JOINED with the Government yesterday in calling for the full disclosure by the British Government of information relating to the Dublin-Monaghan bombings. The Minster for Justice spoke on the issue in the Dáil yesterday on the sixth anniversary of a unanimous motion that called on the British Government to release all the documentation they hold relevant to the 1974 atrocity. Inquiries into the bombings by Judge Henry Barron and Patrick McEntee SC both criticised the British Government for not providing them with complete access to documentation. The families of the victims are also currently in the process of suing the British Government to compel them to release documents. Minister Frances Fitzgerald said that the Taoiseach has raised the matter directly with the British Prime Minster and as has the Minister for Foreign Affairs with his counterpart. “The Government remains in discussions with the British Government in support of the families’ request for access to documentation,” she said. As in the past, this house is unanimous in its message to the British Government to make the relevant documentation available. I hope we can also send a message of solidarity to the families of those who were so tragically killed in Dublin and Monaghan and, indeed, to the families of all those who lost their lives in the conflict. The lack of access to the documentation was raised by deputies Seán Crowe, Dara Calleary, Finian McGrath, Thomas Pringle and Brendan Smith with Smith saying that it is “high time” for the British Government to be open with victims families. British Government spokespeople have said that there is nothing there and that there is nothing to hide. Why then will they not release the files? The relationship with Britain must be based on equality and respect. I must ask you what you believe can be done and what you will do. 34 people died in 1974 bombings. Email “"This house is unanimous in its message to the British Government" - Parties unite on bombing files”. Feedback on “"This house is unanimous in its message to the British Government" - Parties unite on bombing files”.